Jonathan Frakes stepped into the director's chair for an episode that will likely not be moved from my favourites list by the end of the year. It has everything a fan of classic Star Trek could want whilst also managing to embody the spirit of Discovery that has kept it fresh, exciting and unique amongst the Trek series. It's a Prime Directive episode, where the crew explore a civilisation of humanity that has survived on its own in perfect harmony, bringing multiple religions together believing that mankind was extinct and had not advanced among the stars. It may not be without its exposition, but that sort of comes with the territory by now. By Starfleet regulations, planets have to evolve naturally to space travel without their help. The Prime Directive has proved a source of many classic (and not-so classic) Star Trek storylines over the past few years and it's interesting to see how New Eden takes the opportunity to flesh out some of the moral and philosophical ideas at the heart of the franchise. The spotlight too, gets to shine on characters who may not normally get some attention, in particular, Owosekun when she joins Pike and Burnham on a mission to the planet's surface. Hopefully more of the bridge crew get the same love over the next few weeks. New Eden was a relatively self-enclosed episode and it speaks volumes about the direction that Discovery could be headed in. It does lay some of the groundwork for the rest of the season with the whole mystery concerning the angel's identity and more revelations about what happened to Spock, but the bulk of the episode can be watched without knowing what's happening in the rest of the series. There's no baggage from Lorca's tenure as Captain here. Arthur C. Clarke brought up the idea that "Any sufficiently advanced technology is indistinguishable from magic," and it's something that we've seen a lot of in the Marvel Universe especially when concerning the idea of the Asgardians, in fact, as we learnt from Doctor Strange, the actual magic in that universe is very different from Asgardian magic. At first the Angel would appear to be some kind of magical being, but it is it just using technology that Starfleet don't know about yet? And to the villagers, Starfleet might as well be magical. It's a compelling mystery that has the potential to become as insane as the first season was. It's always fascinating to learn more about Earth's past in the Star Trek universe and the exploration of World War Three was compelling. If the people were at one point part of Earth and belonged to it, do they deserve the knowledge that their people survived and flourished? Or is that for them to work out on their own? It's what one of the civilians, Jacob, and his family, have been trying to find proof of for his entire life, and one of my favourite scenes of the whole series comes when Pike, at the end of the episode, after being convinced by Burnham, reappeared before Jacob to offer a power cell in exchange for a soldier's helmet in full Star Trek uniform. 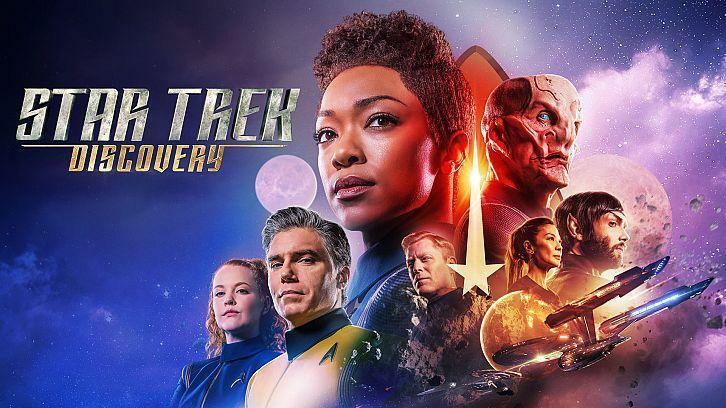 It's been hard as a Hell on Wheels fan (I reviewed the show for STV when it aired) to shake off that image of Anson Mount playing Cullen Bohannon as a rogue cowboy, but Discovery makes it pretty clear that Pike is not your typical Starfleet desk officer, or even your typical corrupt Starfleet officer. He's an idealist who believes in the best of people and the charm and gravitas that Mount brings to the role makes him an excellent addition to the series, and it says something when an actor as good as Jason Isaacs is quickly forgotten about. It's also incredibly refreshing to see the Spock/Kirk roles reversed between Burnham and Pike, as usually the main character would fit the Kirk role. By not giving Burnham Captaincy, it's allowed her to operate the way she sees fit. The action back on Discovery was just as exciting to watch unfold and just as good. Tilly's over-eagerness landed her in trouble as they try to save the planet below from an doomsday scenario. The back and forth moments of the team working together on the Discovery whilst the action was happening on the surface planet was brilliant to watch, and it's interesting to see that the show isn't ignoring Saru, who reminds Tilly that they need to take care of themselves before taking care of others. Stamets has already stated that Tilly cares too much for people and it's what makes her such a great character. Both Saru and Tilly are embodiment of a hopeful, optimistic future for the show and the more screentime they share, the better. Away missions are often exciting and represent a break from the main plot of Discovery and it was one reason why Si Vis Pacem, Para Bellum was so good. This show has remained my second favourite Star Trek series after Deep Space Nine and I don't see that changing anytime soon, and if I was grading the individual episodes, New Eden would earn a perfect 10.